Been a long time since I’ve given any updates, but I’ll try to remember all that’s gone on all summer and fall to keep you in the loop, so to speak. It was a real busy season for all kinds of turtles and tortoises, and fortunately homes were found for all adoptable turtles/torts. I think my last count was something like 36 Sulcata that were placed. I’m sure there were more than those and once I get through all my paperwork I’ll have a more accurate number. We had several Sulcata that were dumped at the local ecology site. One in the greenhouse which was probably the worst place for dumping since they use chemicals on their plants; the other was dumped in the field on a cold Friday night after all the staff had left. Luckily security spotted him and called one of them back and they brought the tort here. If he had found his way into the woods surrounding the place he surely never would have survived the winter. Please, if you have a tortoise or turtle that you can no longer keep, seek help, don’t dump it. Unfortunately as of July 1st new regulation went into effect in Florida and no more Red ear slider turtles are permitted to be shipped into the state as pets. We had one person there with a huge pond that was accepting all that we couldn’t find homes for. Now that we can’t ship to her any longer, we are forced to turn away many, many RES. If you or someone you know has a large secure pond and can accept even one RES it would be a great thing to do. I hate turning them away as I’m sure many are being dumped, but I just don’t have the space here to house any more than I’ve already taken in. Of course I still take emergency cases like abandoned or hit by car, etc., but no longer can take them from everyone like we used to. I currently have two needing homes, so if interested let me know. A young female approx. 4″ and a teeny tiny hatchling. Julie Maguire is looking for a few good ponds. Feral kitties and Labrador retrievers and all those other usual suspects are not the only ones who need rescuing in these precincts. 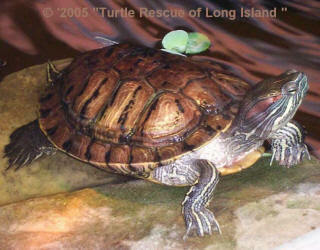 Abandoned and unwanted turtles and tortoises are more common than you might think, which is what prompted Maguire, of Lake Ronkonkoma, to found Turtle Rescue of Long Island (turtlerescues.org - don’t forget the “s”) in 2004. Formally known as Trachemys scripta elegans, the semi-aquatic turtle with the red slashes on either side of its head originated in the Southern United States, but its popularity has made it a world traveler. Residing in ponds, lakes and creeks - anywhere the water is fresh and calm - sliders love to bask on rocks or logs, sometimes even atop each other. Their nickname comes from their quick skittering off their basking spot when approached. Federal law prohibits the sale of tortoises and turtles of less than 4 inches in diameter. (This theoretically is the size at which the animals cannot be placed in a child’s mouth, reducing the risk of salmonella transmission, which is always a concern with reptiles.) Still, red-eared sliders are widely available as hatchlings, sold in tourist areas and ethnic neighborhoods such as the metro area’s many Chinatowns. Impossibly cute, sliders grow to be up to a foot long and require lots of room - a 55-gallon tank at minimum. Because they sleep, eat and defecate in their tank water, conditions can get rather, er, ripe, unless owners are assiduous about filtration and cleaning. Maguire figures she gets three to four calls a week from slider owners looking to relinquish their once-cute charges. The best she can do is put them on a waiting list. “We are so overwhelmed, we can’t take red-eared sliders anymore,” says Maguire, who used to ship rescued sliders to Florida - until that state made them illegal earlier this year. That leaves private local ponds that are securely fenced: Pushy predators, sliders can easily edge out the native terrapin population. The pond also has to be deep enough for the turtles to overwinter. While it is illegal to release a captive turtle in the wild, Maguire suspects desperate slider owners are doing just that. On the subject of difficult-to-place turtles, the sulcata tortoise runs a somewhat close second to the red-eared slider in terms of the numbers that are coming into rescue and the difficulty in placing them. Native to northern Africa, sulcatas are large grazing turtles that can easily reach 90 pounds and the proportions of a television set. Unable to survive our winters, they must be sheltered indoors roughly half of the year, and their take-no-prisoners approach to home decor has prompted some to eat through drywall. “They can’t be kept in a tank - they need a room,” says Maguire, who sends her sulcata rescues to more Southern climes, where they can live outdoors year round. Whether a sulcata or a slider, most owners had little idea that their saucer-size critter would grow into such a big problem. Copyright © 2007, Newsday Inc.